Serrulate-Leaf Grewia is a small tree with slender branches, bark dark grey. Leaves are simple, alternate, distichous; stipules lateral; leaf-stalk 5-10 mm, slender, star-shaped-velvet-hairy, swollen tipped; blade 5-13 x 2-5 cm, elliptic, elliptic-lanceshaped, oblong-lanceshaped or ovate-lanceshaped, base pointed or round, tip tapering or caudate-tapering, margin sawtoothed, 3-ribbed from base, lateral nerves 4-5 pairs, pinnate, prominent. 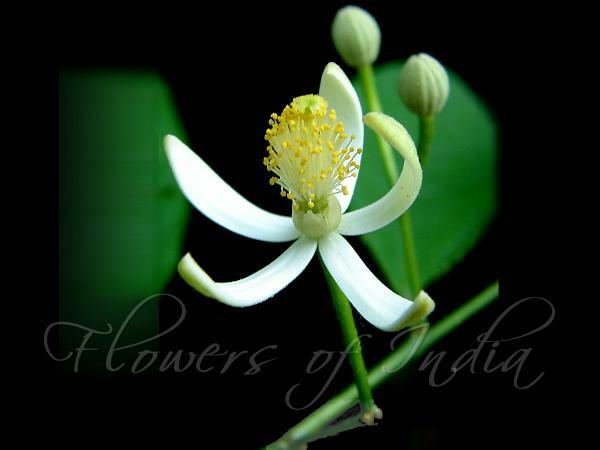 Flowers are bisexual, yellowish-white, borne in leaf-axils in umbellate cymes; flower-cluster-stalks 3 times longer than leaf-stalk; sepals 5, free, 3-nerved, star-shaped velvet-hairy outside; petals 5, white, ovate, shorter than sepals, often notched; stamens many, inserted on a short glandular torus; style longer than stamens; stigma fringed. Fruit is a drupe, 1-4 lobed, spherical, hairless, greenish-black when ripe. 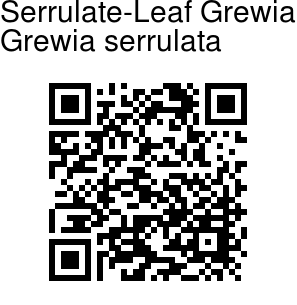 Serrulate-Leaf Grewia is found in Indo-Malesia and Tropical Africa.